The sighting of the month, if not the year, at Lagoon was the discovery of a brown hyena den just five minutes from the camp. 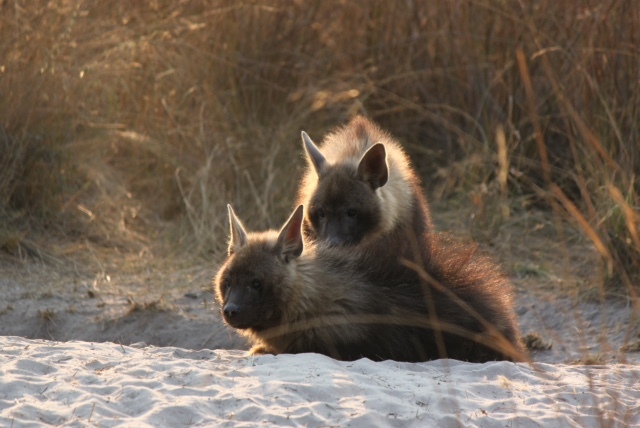 Initially the brief glances that we had of the cubs had us scratching our heads as brown hyena are not even shown on the species distribution maps for the area, so the possibility of aardwolf still seemed more likely. 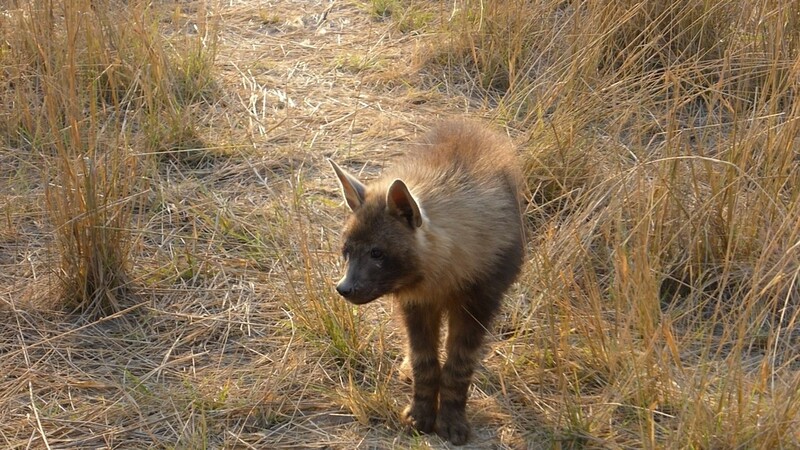 However once the cubs became bold enough to let us have a good look at them we were thrilled to be able to announce definitively that we had brown hyena resident in the Kwando Reserve. Our guides were very patient in terms of getting the youngsters habituated to the vehicles, and their efforts were rewarded by the cubs allowing incredibly relaxed sightings of them playing at the den site. The mother was still very shy and only seen fleetingly by the trackers. We believed that she was visiting the den between midnight and 6am, the only sign of her appearance being the carcasses that she delivered for her cubs. Her meal offerings included a goliath heron, an aged caracal carcass (previously killed by lions) and a piece of buffalo skin. One time a female spotted hyena came and started digging at the brown hyena den, but luckily she didn’t harm the cubs. The Lagoon resident pack of wild dogs were seen regularly at the start of the month; the six adults and five puppies all seemed to be in good shape. We were able to follow them hunting near to camp and saw them having some commotion with spotted hyenas. One of their more spectacular hunts saw them chase an impala into the river where it was promptly caught and eaten by a crocodile. Not a successful day for the dogs, but an incredible safari experience for our guests. As the month progressed the puppies started to join the adults on hunts and therefore the pack became more nomadic. The spotted hyena clan comprising more than ten adults and eight cubs moved to a new den site after one of the cubs was killed, most likely by a lion. The adult hyenas took in turns to be at the den, usually no more than six individuals at a time. As well as suckling from their mothers we were able to watch the youngsters tussling over a buffalo leg which had been brought to the den by one of the adults. Two different coalitions of male lions were located during drives, six individuals in total. Two females, a mother and daughter, appeared to be excellent hunters and we found them feeding on zebra and wildebeest carcasses. One time we witnessed them killing a small warthog, but their meal was snatched up by hyenas. Another time we were able to follow them hunting a wildebeest and making the kill. We picked up the tracks of a lioness with three cubs on the western part of the camp; we followed up into the mopane woodland and found her feasting on a buffalo. This was the first time that we were able to see her cubs in plain view. Another time we saw her on a wildebeest kill. The Bonga pride of ten lions were back into the Lagoon side of the Kwando Reserve and we watched them following the buffalo herds. The two cheetah brothers were only occasionally spotted but seemed to be doing well. A shy tom leopard was located near to the airstrip and the resident young male seen at the riverside. There were also two female leopards in the area, mother and daughter but now separated. We found them hunting at saw that they were each making successful kills of impala. Sable and roan antelope were seen feeding together as a mixed herd. Giraffe, wildebeest, red lechwe. tsessebe, impala, warthog, baboon and zebra were all present in plentiful numbers. 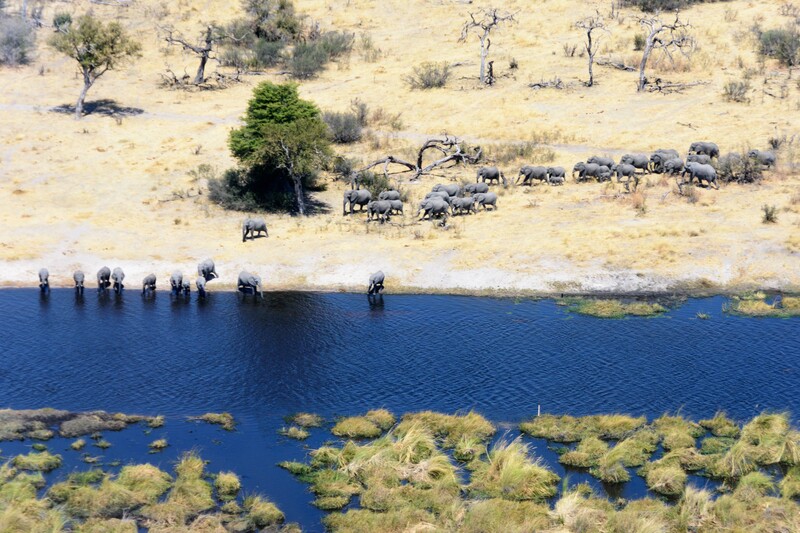 Big herds of buffalo and elephant (up to 100 strong) were in the area, with many elephants swimming and drinking at camp. Sitatunga were seen during the boat cruise. A lioness was seen stalking a caracal and eventually ended up killing the smaller cat. A mother porcupine was walking down the road accompanied by her baby. Honey badgers were located digging for mice, and one time they were following a honeyguide bird through the bush. A serval was found hunting in the marsh areas a couple of times. Other smaller mammals seen by guests included African wildcat and bat-eared fox. An African scops owl was seen at the camp almost every day at the start of the month. Brightly coloured carmine bee-eaters were starting to arrive earlier than usual at the Kwena Lagoon – a nesting site which they use annually. Another summer migrant, yellow-billed kites, have also started to be spotted again. Slaty egrets, black herons and ground hornbills were found near to Watercut. There was a great sighting of a martial eagle killing a helmeted guinea fowl and taking it up a tree to eat it. Wild dogs were seen most days during July including a thrilling chase of a kudu right through the middle of camp which nearly ended up with kudu falling into the swimming pool! 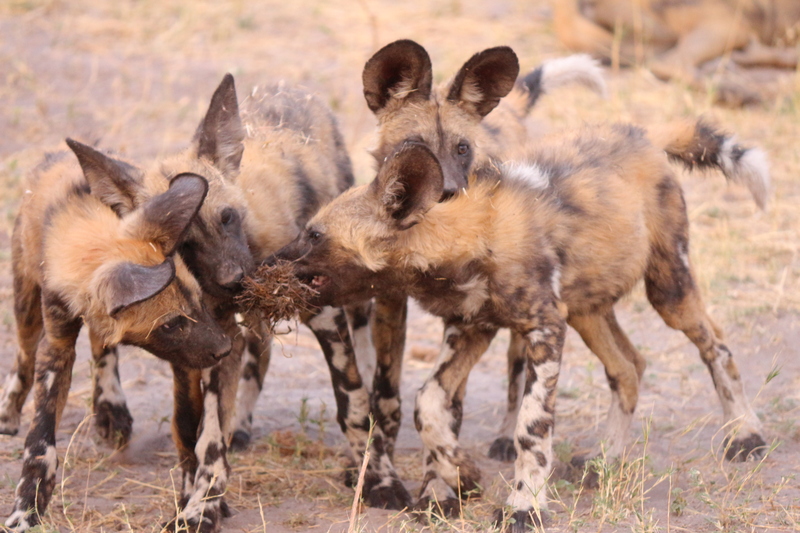 The adults moved the puppies to a new den site about seven kilometres from their original den where we were able to watch the pack’s wonderful interactions including greeting rituals and the adults coming back to regurgitate food for their young. Sadly, the pack of wild dogs continued to lose puppies; from the original litter of thirteen there were only five remaining by the end of the month. The guides have noticed that this pack choose rather shallow holes for their dens rather than using deeper aardvark holes which would give the puppies greater protection from predators. The adults were seen hunting frequently including warthog, kudu, wildebeest and impala. Ten members of the Bonga pride were mostly located at the midway point between Lagoon and Lebala camps. They have been pushed into this area by the coalition of four new males who have taken over the territory at the northern part of the Kwando Reserve. Three of the males appear to be more dominant and seem to be fighting with the fourth male who picked up a fresh scar to his face as a result. There was a pair of lionesses with a cub who seemed nervous of the males and were keeping well into the marshlands where the cub could be hidden in the reeds and sedges. 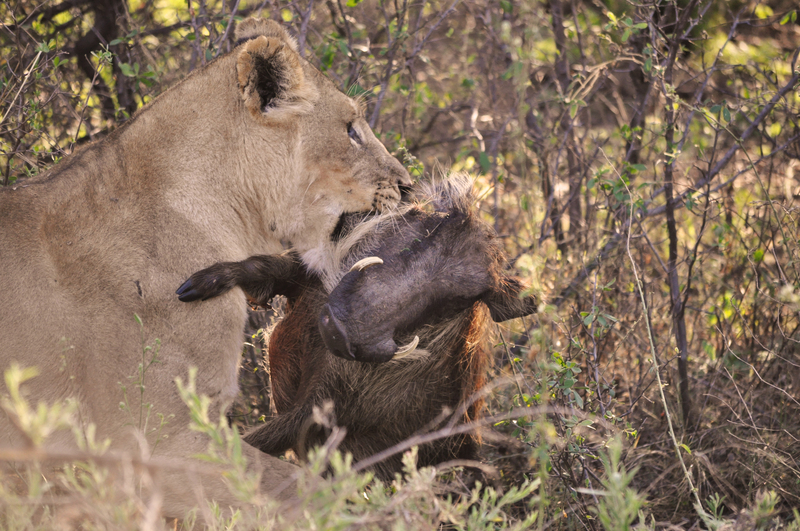 We saw them raiding a kill from a big male leopard, other times they seemed to be preying on warthogs. A lone lioness was seen following the buffalo herds around and once we found her feeding on a successful kill. We came across a male and female lion mating. 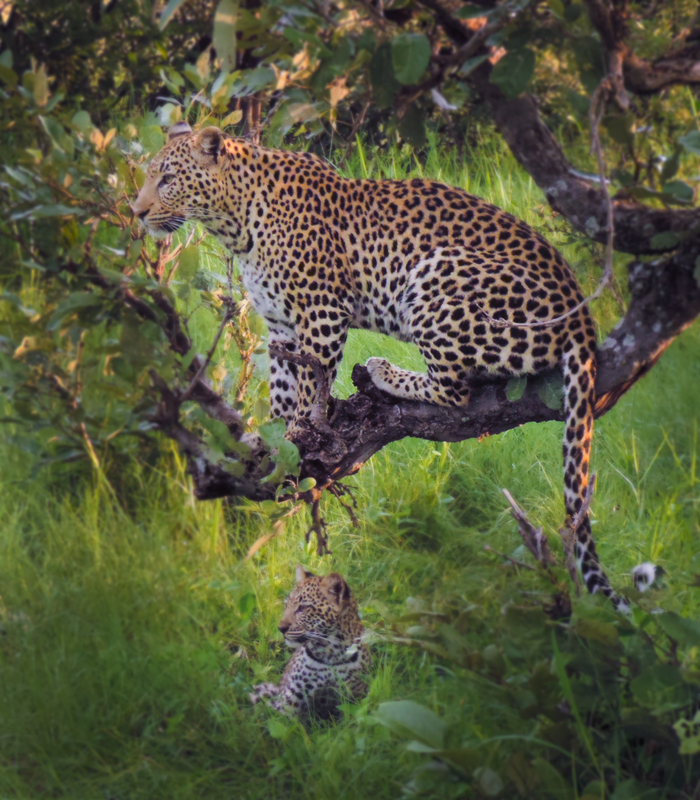 The resident female leopard was seen feeding on an impala up a tree in the Kwena Lagoon area. It appears that her two sub-adult cubs have now separated from her completely. The young female was seen mobile but appeared to be sniffing and tracking. She succeeded in flushing out and mobbing a hyena who was dragging a tsessebe carcass. The young male was found resting on the river bank as we were doing a boat cruise. The hyena den was active with up to nine cubs being seen at once, accompanied by various numbers of adults. The mothers were usually seen suckling their young in the evenings. Some of the cubs were starting to nibble on leftover meat brought back to the den by the females and were becoming quite playful. Several species of mongoose were seen (banded, yellow, dwarf and slender). Honey badgers were located digging for mice. Night drives yielded sightings of aardwolf and African wild cat. Jackals, bat-eared foxes, African civets, caracal, genets, bush babies and were other smaller mammals spotted. The coalition of two cheetah brothers were located hunting through the woodland and were seen chasing giraffe, a surprisingly large prey species for them to try and tackle. They were unsuccessful on that occasion but at other times we saw them looking relaxed and full-bellied. 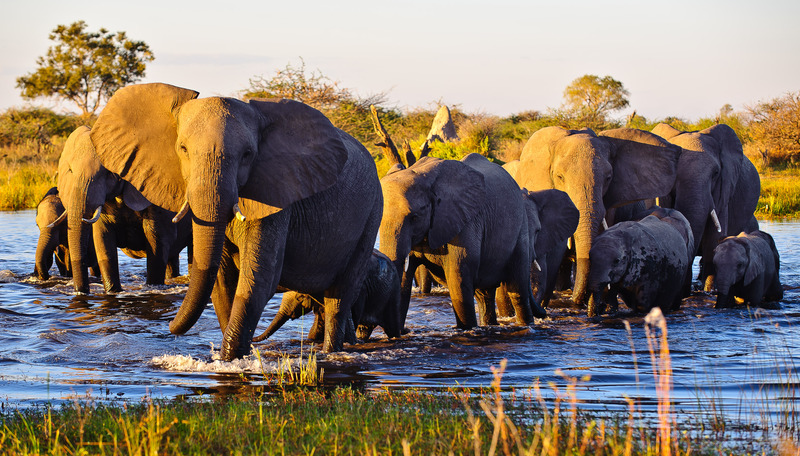 Big herds of elephants were coming through camp to drink at the lagoon in front of the rooms, some making a foray into Namibia and back again. Bachelor herds of buffalo were all over the mixed woodland and riverine areas with breeding herds showing up on the floodplains. Eland, roan and sable antelope were seen along with giraffe, waterbuck, zebra, wildebeest, impala, reedbuck, tsessebe, red lechwe and kudu. Along the river bank we saw hippos basking in the sun and huge crocodiles out of the water. Sitatunga were spotted during the boat cruise as well as monitor lizards, red lechwe, waterbuck and reedbuck. Birdlife was great with raptors, kingfishers, bee-eaters and lots of water birds such as storks and ducks. Vultures, tawny eagles and bateleur eagles were seen near to wild dog kills. 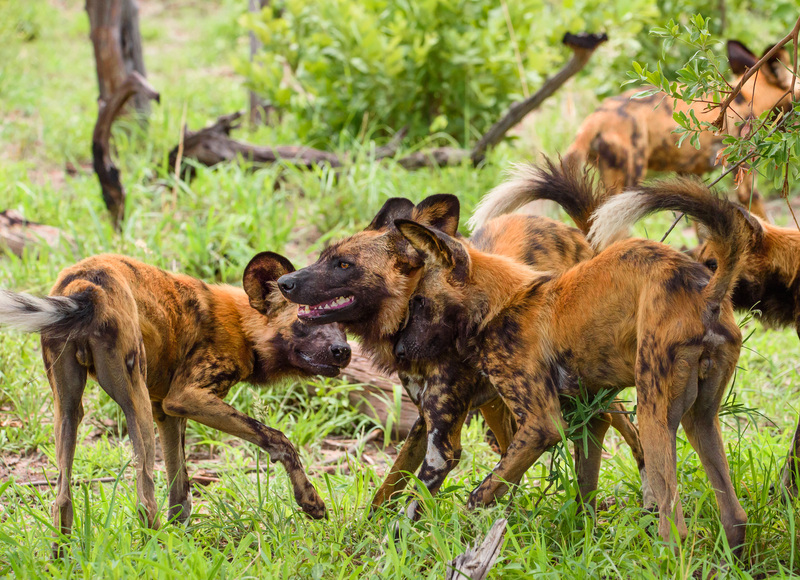 Wild dogs were still denning near to Lagoon camp in June giving incredible sightings of the mother nursing and the whole pack interacting, including their “greeting rituals”. The pack comprised six adults and they hunted every day to give the alpha female and her puppies sufficient food. Towards the end of the month the eleven puppies were getting quite bold and were curiously approaching our vehicles. The female who lost her puppies to the alpha female the previous month appeared to have recovered well from their fight. The dogs had good success hunting in the riverine area where they were seen feeding on a female kudu and sub-adult waterbuck. Spotted hyenas also had a den in the area with seven cubs of varying ages. Most appeared to be doing well, though towards the end of the month we noticed that one youngster was getting weaker and was being bullied by the other cubs; this is quite normal dominance behaviour within the clan. 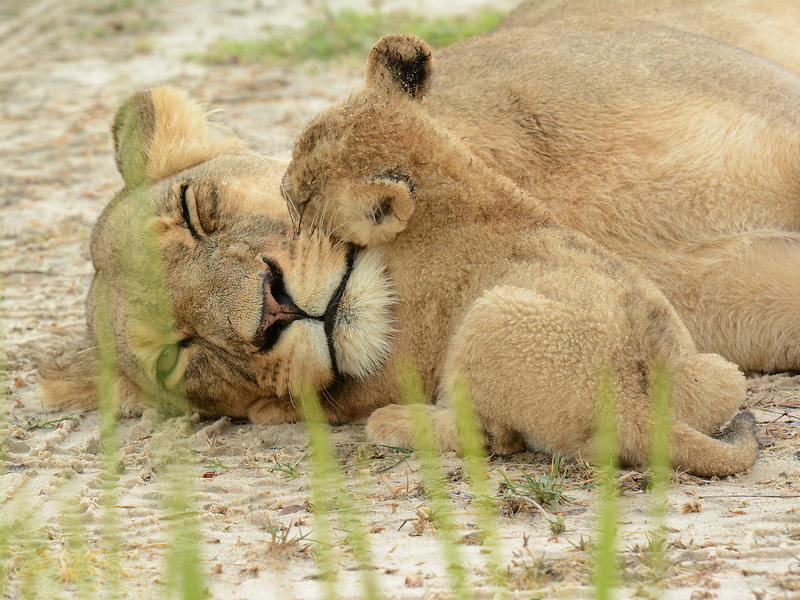 There were usually a few adults left behind to guard the den site and guests enjoyed watching the mothers tenderly nursing their young. The cubs were being very playful and one day we watched them having a tug of war over a warthog skull which the adults had brought back to the den. Two sub-adult leopard cubs aged 10-11 months are now more independent and were seen increasingly on their own, as well as with their mother. The cubs were now at a stage where they were practicing their hunting skills on mice and birds meanwhile their mother was keeping their bellies full with impala, warthog and baboon carcasses. The young male appeared to be splitting away from his sister and mother completely and one day paid us a visit at camp, passing between Room 1 and the main area. The female leopard came into oestrus and then was seen together with a very nervous adult male. A group of five lions were seen in Lagoon during the month consisting of three males and two females. One of the males is markedly more skittish than the others and tends to keep himself a bit more separate, especially when vehicles are around. The other two brothers were patrolling huge distances to mark their territories, sometimes splitting apart to cover different areas. One of the females came into oestrus during the month and was duly mated. As a pride, they seemed to be specialising in wildebeest as a favourite prey species, but the lionesses were also seen visiting warthog burrows in the late afternoons as the temperature cooled down. The coalition of two cheetah brothers were seen occasionally. On one occasion they were hunting a huge male warthog, but he stood his ground and eventually chased the cats away. They were also seen hunting red lechwe. Aardwolves were located more than once during night drives. We saw a caracal successfully hunting mice through the grasses and it eventually moved into a more open area giving everyone a good view. Other smaller mammals located included African wild cat, honey badger, African civet, genets, bat-eared fox and side-striped jackal. General game was very good throughout the month including large herds of elephant, giraffe, zebra, wildebeest, impala, kudu, red lechwe, tsessebe, eland and waterbuck. Endangered roan and sable antelopes were also enjoyed by our guests. 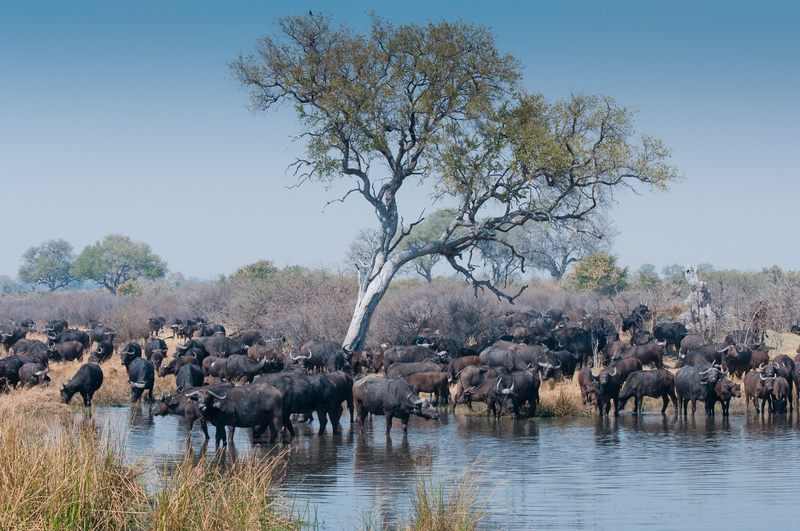 Large buffalo herds have come back out of the mopane woodlands and were often found drinking by the river. Notable bird sightings included saddle-billed storks, ground hornbills, secretary birds, pearl-spotted owlet, Verreaux’s eagle owl and black herons. Short-tailed and tawny eagles could be viewed following the hunting wild dogs, hoping to be able to scavenge the carcass. A large group of vultures were seen at their bathing spot. 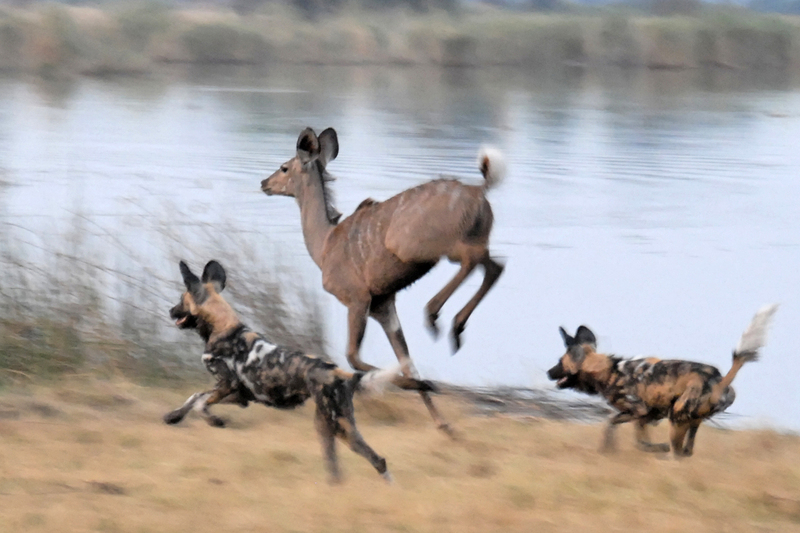 Wild dogs were denning near to camp throughout the month of May. Two separate females had conceived within our resident pack of six and they made den entrances approximately fifteen metres apart. Towards the end of the month four puppies emerged from den and could be seen suckling. The second litter was born on the 24th May. The dogs tended to stay fairly close to the den and were seen feeding on kudu, warthog and impala. We witnessed them regurgitating food for both pregnant females after their hunting missions. A mother leopard known as Mma Maporota (Mrs Sausage Tree) was seen on an almost daily basis, with her two subadult cubs, one female and one male. Sometimes they were seen apart and other times feeding or hunting together; when they had a kill they tended to stay in the same area for several days. The adult female spent a good amount of time marking her territory by scent marking and clawing trees. After a lot of patient searching by our guides we located two hyena dens in the area. Evening visits were particularly rewarding as we were able to see the adults socialising with their young and greeting each other before setting off on patrol. At one of the dens there are five cubs, ranging from several weeks old to approximately 8 months. They were very playful, sometimes curiously approaching the vehicle. The coalition of two cheetah brothers continued to cover huge areas but were seen often in the Lagoon side of the Reserve. The guides suspected that they were trying to stay away from the Bonga Pride who were located more towards the east. The males were located patrolling their territory and also hunting various species including impala, warthogs, tsessebe and even young kudu. Four young male lions were still in the area, having come from the north. They were generally seen on the move and were still skittish around vehicles, but we hope that they will relax over time. They sometimes split up to track females and could be heard roaring in the early mornings. A lioness with one cub was seen hunting impala and zebra along the woodland, but they also seem to specialise in warthogs and could be seen checking out burrows looking for prey. One time after they had brought down an impala the hyena clan came and raided their kill. Two new pale-coloured lionesses seem to have taken up residency in the area and were seen in the vicinity of an elephant carcass. After a few days they were joined by two big male lions and were seen mating with them. Towards the end of the month two separate prides were seen fighting over the elephant carcass; the dispute continued over a three-day period. In the end a coalition of three lions disrupted and pushed away the four younger males. A female from the Bonga Pride was also seen towards Halfway Pan; she looked like she was nursing, so it is likely that she had split away from the main pride to give birth. It seems that the Bonga Pride are starting to move back towards the Lagoon side of the Kwando Reserve, having spent the last few months in the Lebala area. General game was very good along the floodplains. There were two relaxed herds of sable and roan antelope and plentiful zebra and wildebeest. As the weather cooled, hippos were seen out of the water during the day more frequently. Elephants, buffalo, eland, tsessebe, giraffe, impala, steenbok, kudu and hartebeest were also seen. There were good sightings of smaller mammals including African wild cats, bat-eared foxes, civets, genets, bush babies and servals. Aardwolf were seen several times towards the end of the month, though sadly we found aardwolf carcass at the vacated hyena den (one was also found the previous month). As usual, there were good numbers of raptors and vultures in the Kwando Reserve. A family of endangered Southern Ground Hornbills were seen frequently. Ostrich were seen graving alongside plains game. Crocodiles could be seen during the boat cruise and monitor lizards were seen mating.